Looking for Rock or Pop RealTracks and RealDrums? PG Music makes it easy with Rock-Pop RealPAKS 1-15! Rock-Pop RealPAKs 1-15 include a collection of PG Music's popular RealTracks and RealDrums for Rock. These are not samples, but full recordings by professional musicians that replace the MIDI track in your arrangement and play along in sync to the chord progressions you enter. Purchase all 328 RealTracks Sets with over 2,700 RealTracks (2,900+ hours of studio musician audio recordings) in the Band-in-a-Box® 2019 UltraPAK, UltraPAK+, or Audiophile Edition. RealTracks and RealDrums sound real because they ARE real! 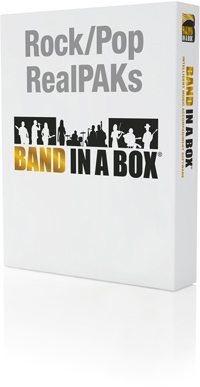 Add a human element to your Band-in-a-Box® and RealBand arrangements with RealPAKs! **Note: Requires Band-in-a-Box® 2019 or higher. RealTracks Set 313: More Klezmer! **Note: Requires Band-in-a-Box® 2018 or higher. **Note: Requires Band-in-a-Box® 2017 or higher. **Note: Requires Band-in-a-Box® 2016 or higher. RealTracks Set 230: Surf Rock! **Note: Requires Band-in-a-Box® 2015 or higher. **Note: Requires Band-in-a-Box® 2012 or higher. RealTracks Set 188: Slow Background Pop Horn Section. RealTracks Set 190: New Orleans Boogie! RealTracks Set 191: Funky Electric Piano & More! RealTracks Set 192: Dance: GirlPop, '90s & Mpore! RealTracks Set 193: Dance: Disco & More! **Note: Requires Band-in-a-Box® 2011 or higher. RealTracks Set 170: Texas Blues-Rock. 2 Rhythm Guitar styles, 2 Electric Guitar Soloists, an Electric Bass and Piano and Sax soloists. RealTracks Set 171: Medium Folk-Pop 8ths. Accordion, Fiddle and Mandolin. RealTracks Set 172: EuroDance! Modern and vintage synth tones. RealTracks Set 173: Celtic Bouzouki and Guitar. 2 Acoustic Guitar styles and 2 Bouzouki styles. RealTracks Set 174: Pop Mandolin, Piano and Guitar. Mandolin, Piano and Guitar. RealTracks Set 175: Texas Blues-Rock: Smokin' Blues Sax. 4 Alto Sax styles. RealTracks Set 159: Folk-Pop Ballads. Accordian, Banjo, Electric Bass, Fiddle, Acoustic Guitar, 3 Electric Guitars, High-Strung Acoustic Guitar, Mandolin, and Acoustic Piano. 67-71 & Rock-Pop RealDrums Set 27. Includes RealTracks Sets 40-49 & Rock-Pop RealDrums Sets 21-22. Includes RealTracks Sets 5, 6, 10, 20-27, 30-32 & Rock-Pop RealDrums from Sets 1-20. Q: Can I make songs using RealTracks that sound as good as your demos? A: Yes, you certainly can! Our demos are composed and rendered entirely in Band-in-a-Box on a typical computer. We don't use any other programs or special equipment to 'make the demos sound better'. Q: What is your best RealTracks package? A: You can get the most RealTracks by buying either the UltraPAK or UltraPAKPlus.